Well well well! The Baby Lightwaves certainly hit the spot! Blimey! The Past issues chapter are all available to purchase individually on our website. You don’t have to be a member to buy them. But joining the Club(s) certainly has its advantages, with 10% – 15% discount on all Clarity purchases from Clarity directly probably being a major one! Click here to investigate. 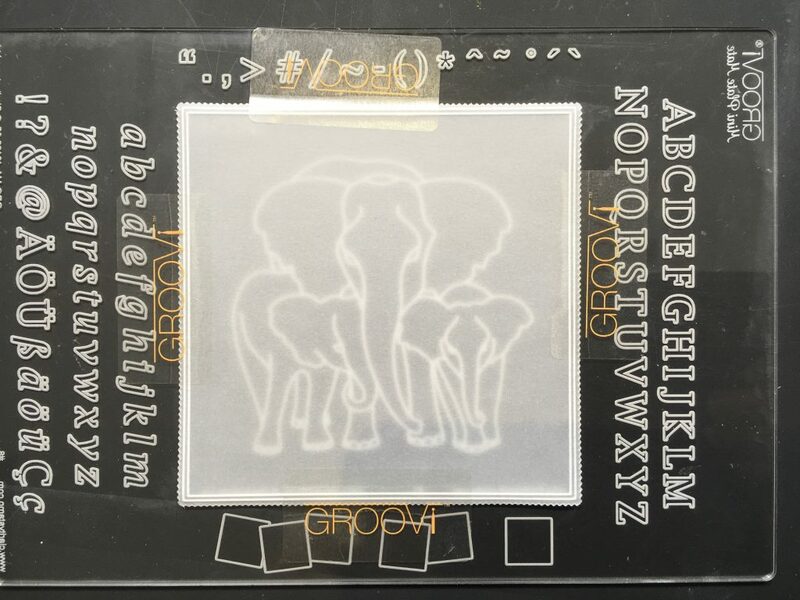 Let’s look at a little trick, using the Groovi Club plate. Picot Cut a square, using the Fresh Cut Picot die and its square Groovi plate compliment. 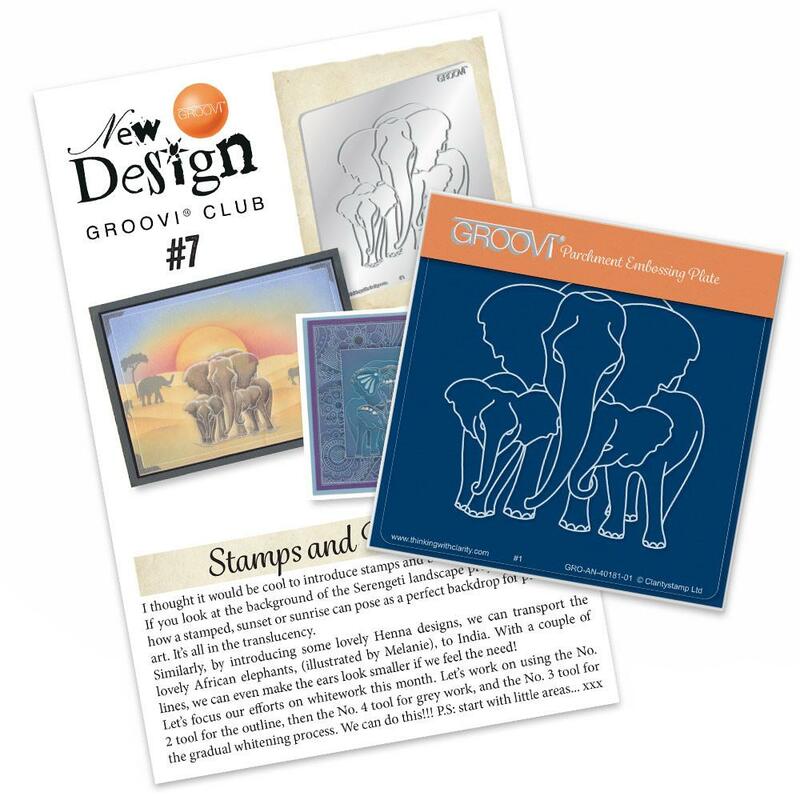 Place the Elephant Baby plate in the A5 Club Plate Mate,(which comes with the Groovi Club when you join) and attach with Groovi tabs to hold it in place. However. We DON’T want the Groovi side! We want the smooth side of the plate facing up. 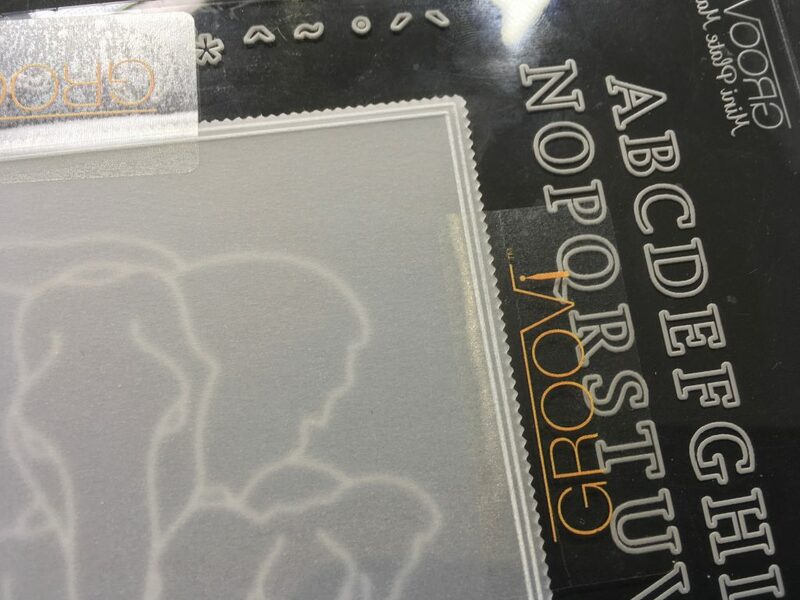 And because we are tracing the plate rather than embossing it, we are working on the FRONT of the parchment. How about that for the opposite of what we usually preach?!? 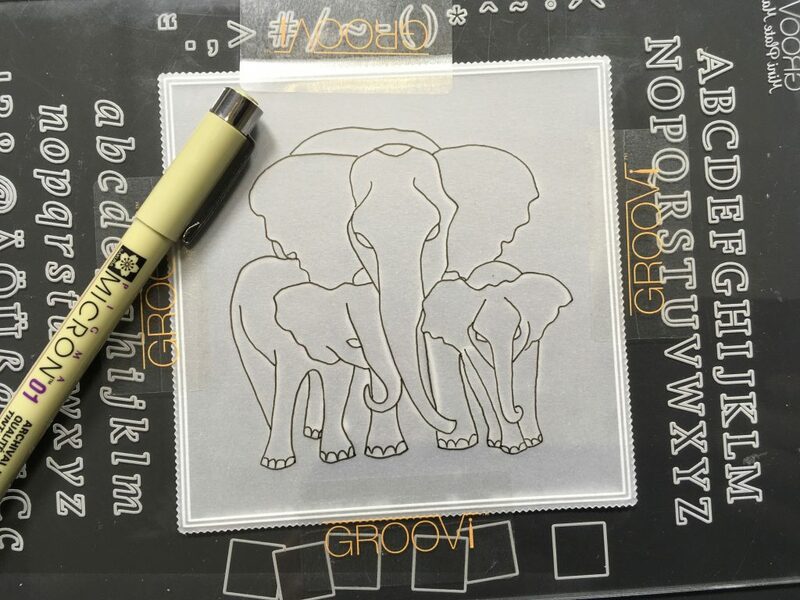 Use a fineline Micron Pen to simply trace out the image. Take your time. Tell you what! If you’ve just bought the little Lightwave – use it!!! A light source underneath certainly helps the process. 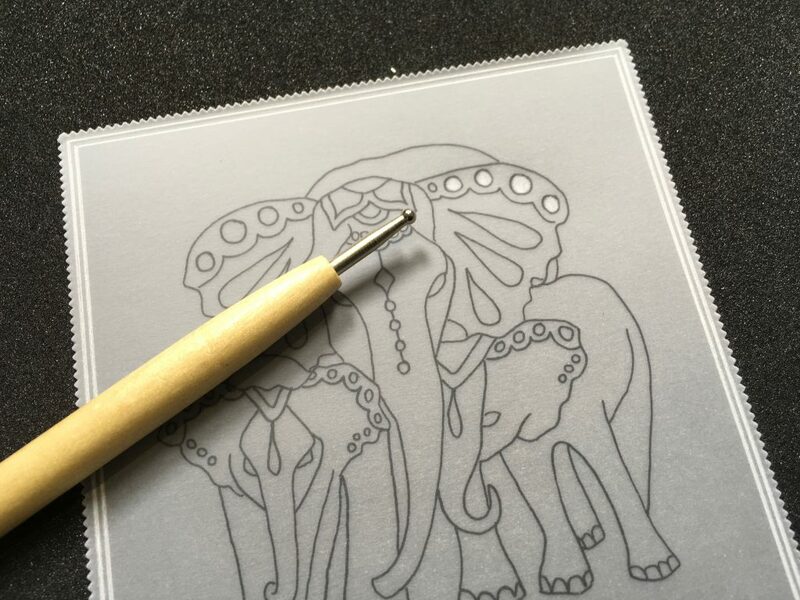 Once you’ve got the outline, add your own design to the elephants’ head dresses. Just go for it!! Make sure you have the black mat flipped to the hard side for this job though. Now flip the black mat from the Starter Kit to the soft side, ready for whitework. We need the ball tools from the Starter Kit too. Using the largest ball tool in the Starter pack, and this time working from the BACK of the parchment, start slowly applying pressure to turn the parchment white. Work in layers and go gently. Let’s jump to the Lightwave and use a grid, a diagonal grid is best for this job. Baby Grid fits in the Club plate mate perfectly. Time for colour. Working from the BACK and flipping to the hard side of the black mat, let’s use the Perga Colour pens. Aha ! Look who’s here to elf! Have you managed to find all the little elves on the website thus far? 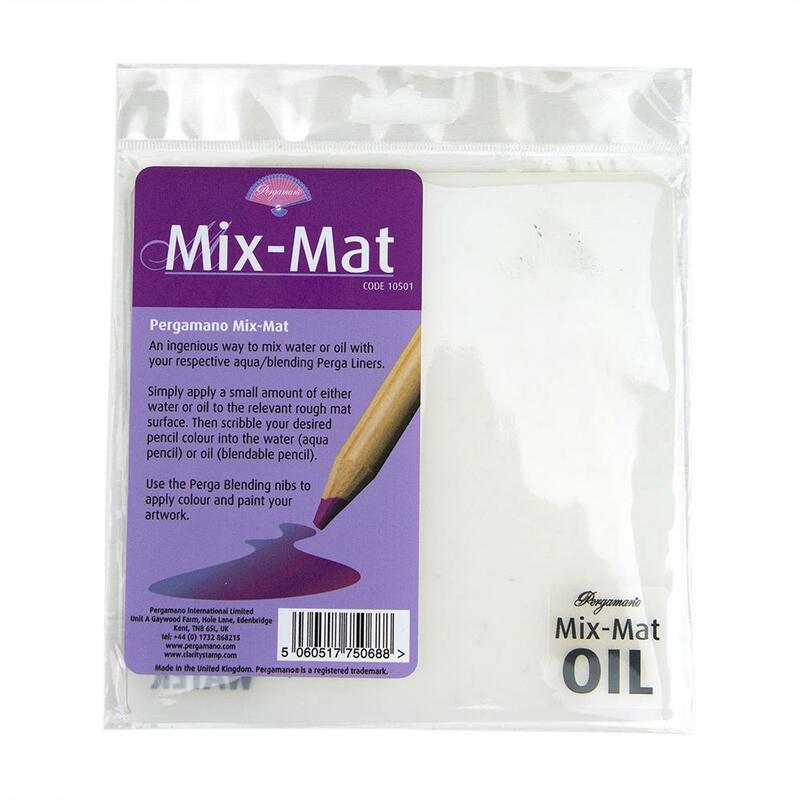 Add a teeny amount of water to the mat we call a Mix-Mat. Scribble a little colour from the pen on the mat, next to the water, then use a Blending pen to pick up the water and then add the colour. This is how to dilute the colour and make it less concentrated/dark. Beautiful! 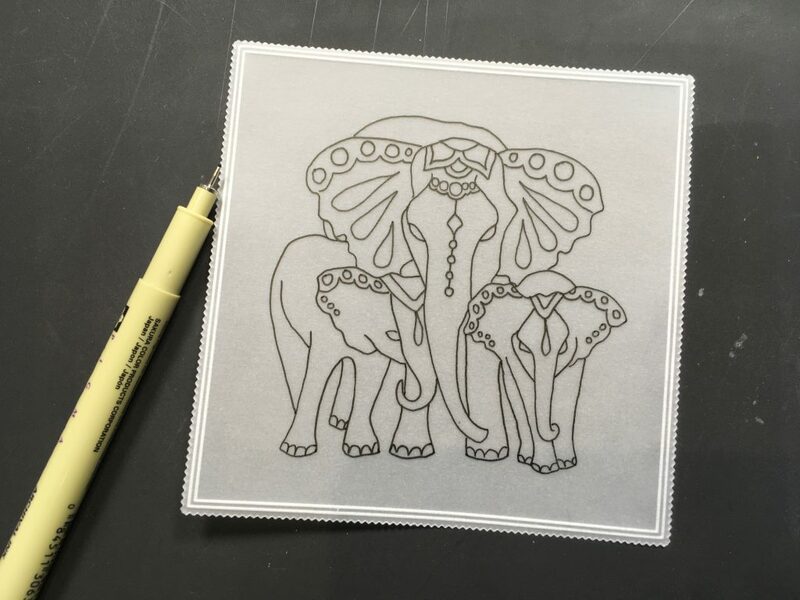 And as you are working on the back, and the line art from the Elephants is on the front, no smudging! Colouring with Perga Colours suddenly became so much more comfortable. Less lines, less instantly dark colour. Build up the depth gradually. Picot cut a piece of Shenandoah card a nested square die larger and attach with little white Pergamano brads in all 4 corners. They are so tiny!! Finally, attach the coloured card to a white card blank. See? When you look up closley, and then compare with the original plate, who would think that it is the same design?! 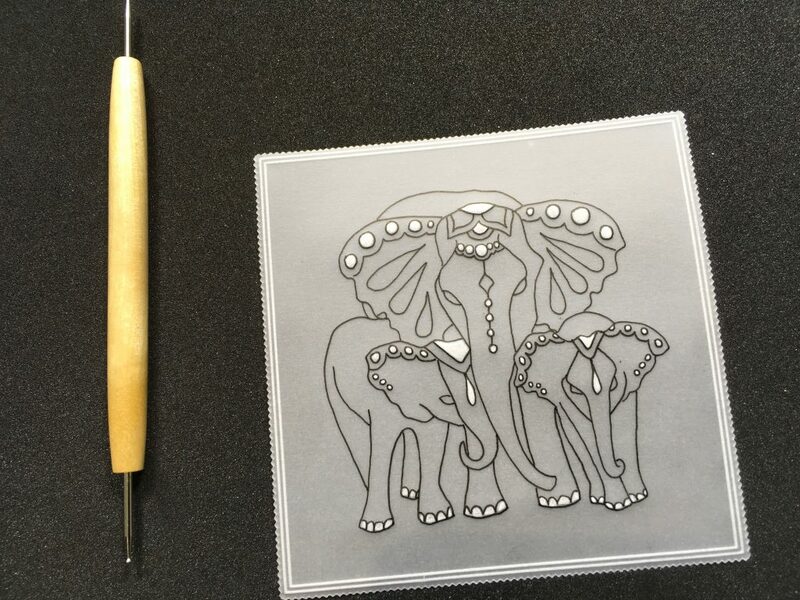 Anyway, that’s just a simple tracing trick using the plate design – which our Melanie drew. Donna, if you find that pause button please let me know as time really is flying by!!! Hi Donna, I know how you feel. The time is going buy so quickly and it will soon be here. This plate was one of my favourites in the club I’m never disappointed with my club each month now I’m joining the die club as I love the dies so looking forward to getting one each month I love the way you have brought the elephants to life cannot wait for my baby light wave .just had an e mail to say my last grey sale parcel is on its way thank you clarity towers for your hard work . 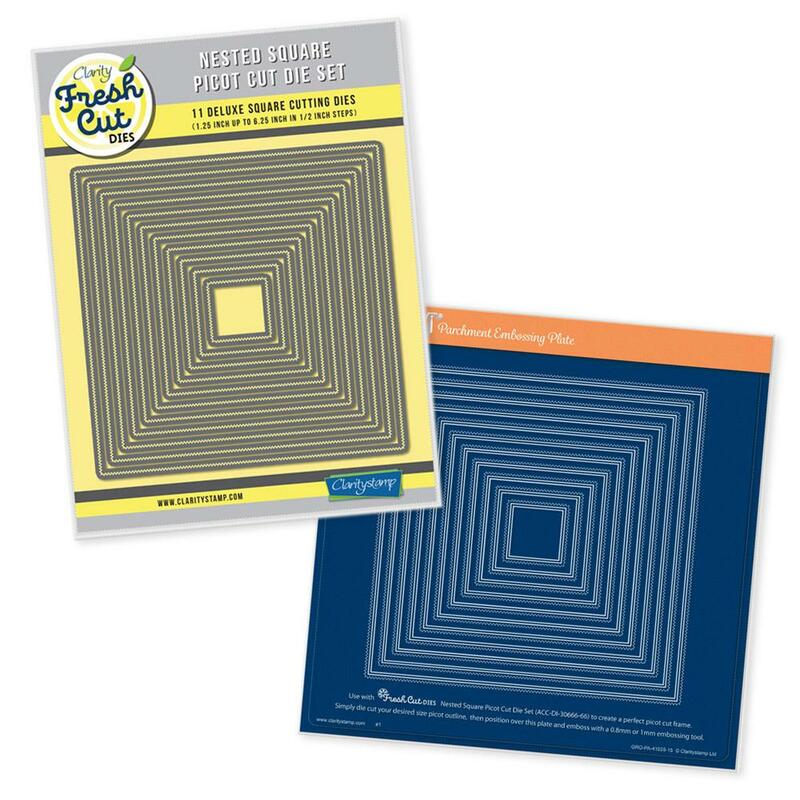 Hi Sheila, yes I am looking forward to joining the Fresh Cut dies club . Hugs back at ya Sheila…..
Hi Barbara, hope you enjoyed your date with Dave. How did the pottery class go? 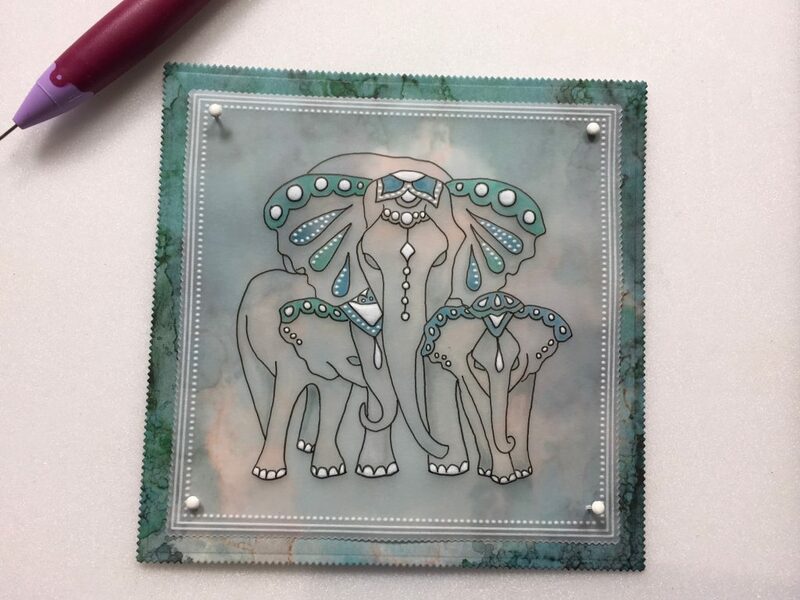 Love elephants and have used this one a lot. I sussed out a while ago that using the smooth side of the plates to trace gave as good an outline as the Groovi side. Also I do like a pen outline and sometimes use Faber sepia on men’s cards and paint with the complementary brush pen instead of using black micron pens. Gives a nice antiqued look. Ordered the mini lightwave and signed up for the clubs yesterday. Found todays elf – this is fun! He is cute – my set arrived today. Have stamped and coloured 12 to help decorate the tree. Love this little plate, but not too sure if my hand is steady enough for this method, however nothing ventured, nothing gained and, if it all goes horribly wrong then it’s only a small piece of parchment isn’t it?! This is lovely, I was so pleased to receive this plate when it came through the door as it makes a great mans card and was different to the flowery parchment designs I already had. 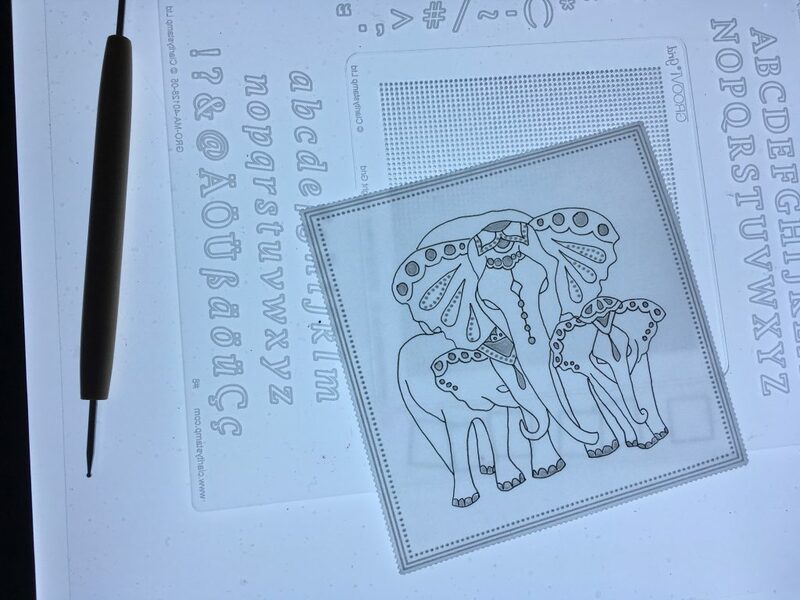 I must give this a go, it looks quite fun and it’s a good way to practise whitework. The new light wave is cute isn’t it, I bet they are flying out the door! Hope you had a lovely time at pottery and a good night with Dave. 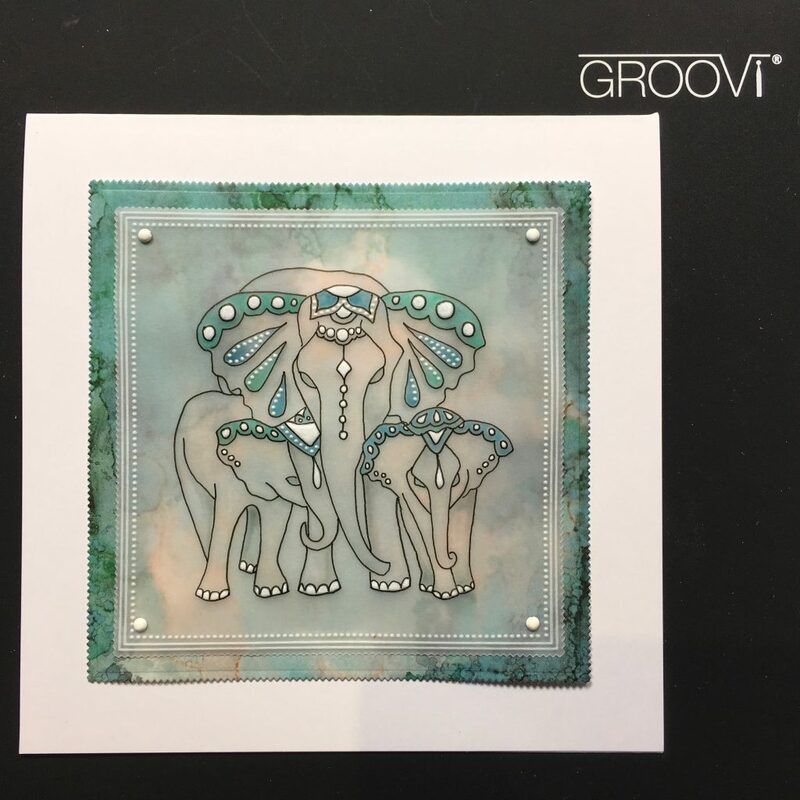 Must look for the ellies -unless my friend has it as she gets groovi club. I remember doing an owl using a similar technique. 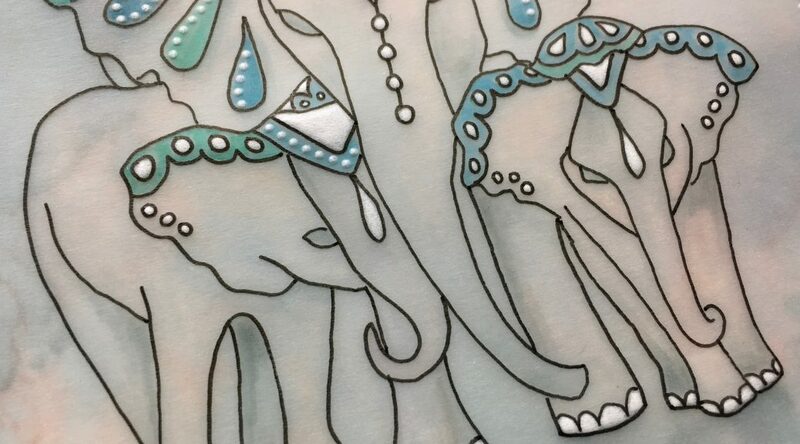 I think the ellies will be easier – no feathers! My second Gray day parcel arrived today, thank you for all the lovely bargains. Joined the ‘die’club today, very little wait for the phone to be answered. Something to look forward to in 2019. I am missing out on the elf hunt, just not my style. Loved today’s demo. One to bear in mind. Thanks for sharing this technique on here, I watched your TV demo but to have it in a picture by picture version it all makes sense. Will have a go at it when I have finished my Christmas projects. I need to get my cards in the post especially the overseas ones as time is creeping on at a pace. I also need to organise my club subscriptions for next year. My to do list seems to be growing rather than shrinking. I absolutely loved this demo on the TV show, great idea and looks so effective and I love this club plate too, I’ve been collecting those from the beginning. I have also been keeping up-to-date with finding Elvis the Elf, I’m in the swing of it now. 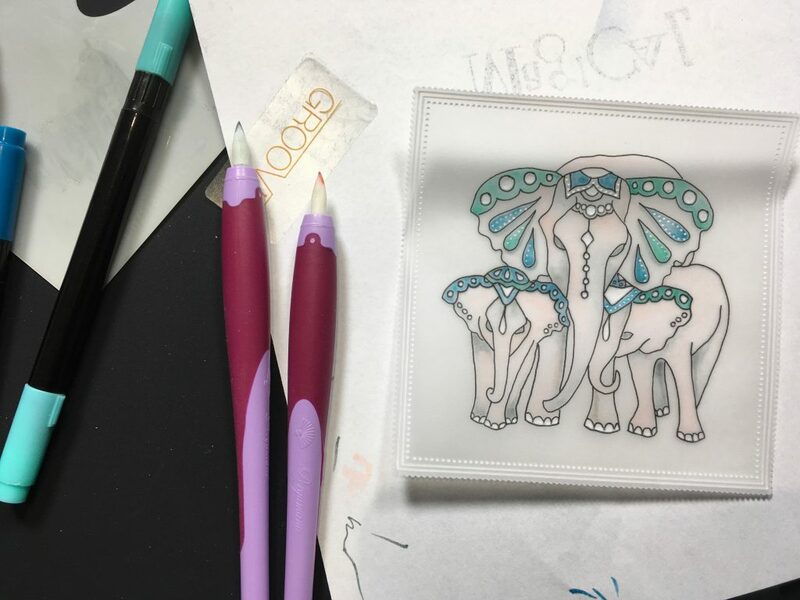 Diese Elefanten ein so wunderschön…..die möchte ich gerne haben…..
Bei Claritystamp habe ich sie nicht gefunden……. 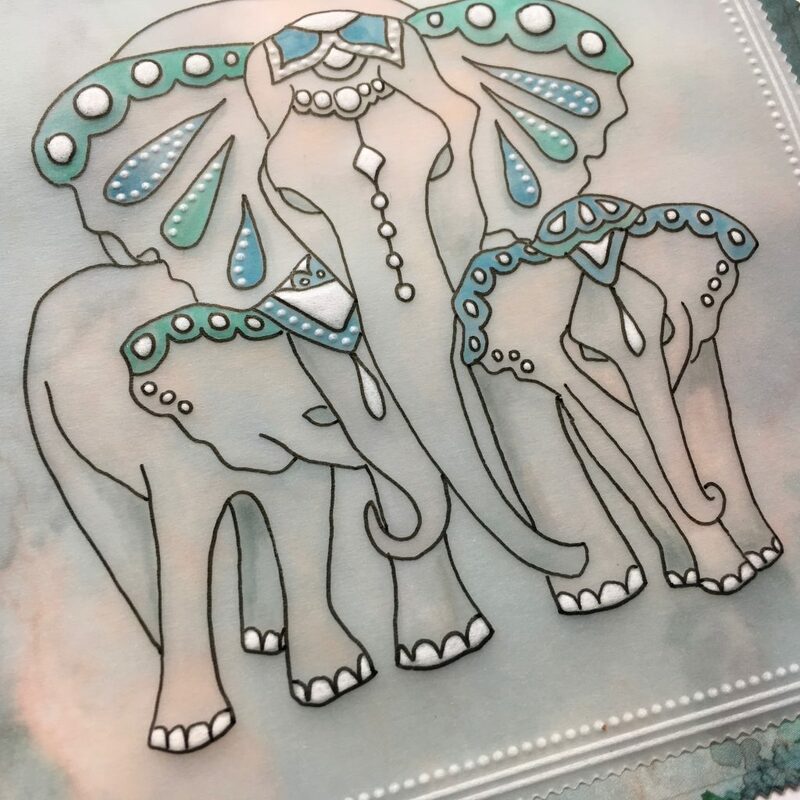 fabulous card, I love it, super stylish , I haven’t got the elephants but may try with another plate. I am working on 2 cards at the mo using the new queen plates .